… which belonged to my grandmother before it belonged to me, and wasn’t new when she acquired it either. Grandma had a large collection of cooking vessels in use as she cooked for her large family and frequent visitors, so I honestly can’t say how much she used this particular skillet, but I know it has a long history and I continue to put it to good use every single day. I use my cast iron skillet to make tostones, hashes, and other dishes on the stovetop, but it becomes particularly useful when I want to combine cooking methods and prefer not to make extra work for myself by dirtying multiple dishes. This recipe is a great example of that – I browned the chops in the pan, then sautéed the vegetables, and then finished the whole thing in the oven. On busy weekdays in particular, I like to keep everything simple! This dish is compliant with both the paleo autoimmune protocol (AIP) and the Specific Carbohydrate Diet (SCD). If you need to reduce your FODMAP intake, you would want to eliminate both the onion and the apple. In their place, I would try using the green part of a leek and a cup of chopped pineapple to provide some sweetness. You’ll see that I don’t indicate any particular “flavor” of bone broth. That’s because I’ve stopped bothering to sort my bones and when I make a batch of homemade broth, I just throw everything I’ve collected and saved from the previous meals into a single batch. I’ve actually found that I like the flavor even better that way. If you don’t want to make your own bone broth, there are several store bought options that I recommend. See this post for details. For AIP-friendly broth and other ingredients, I recommend ShopAIP – an online store that is stocked only with 100% compliant foods! It’s a great place to buy healthy fats like coconut oil or pastured lard, packaged snack foods for travel, and much more. This recipe for a complete meal in a single pan couldn't be much easier to pull together! It is AIP compliant and also suitable for people following SCD, but really anyone who loves good simple food will enjoy it. Place ovenproof skillet (preferably cast iron) over medium-high heat. While skillet is heating, pat pork chops dry and then sprinkle on both sides with salt. Place pork chops in hot skillet and sear for about 4 minutes, then flip and sear for about 4 minutes on other side. Remove and set aside. In same skillet, heat fat then add onion and apple and cook, stirring constantly, for about 2 minutes, until soft and slightly browned. Add cabbage, dried sage, ½ teaspoon salt, bone broth, and vinegar. Cook for about 5 minutes, stirring continually. 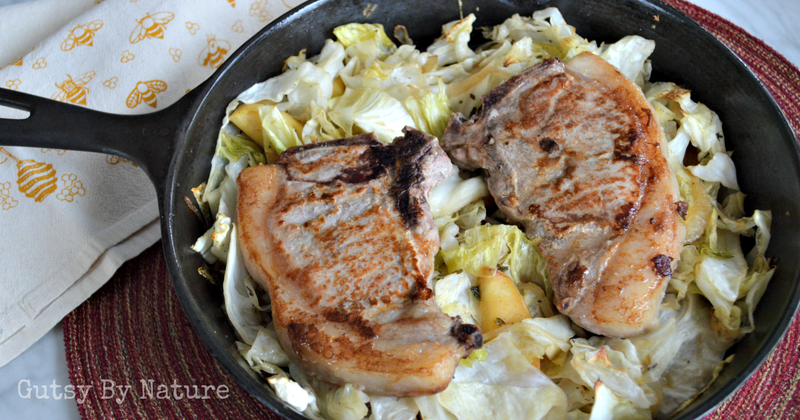 Place pork chops on top of cabbage in skillet and add any accumulated juice into the pan. Carefully place entire skillet in oven and roast for 15 minutes, or until chops are completely cooked through. I made this tonight for dinner. It is a keeper. This was a nice change for pork chops. I will use two onions and apples and chopped the cabbage next time.